I've been getting quite a few emails asking to know what is happening on the adoption front. I have have been reticent to publicly address this as I have worried it may impact any chance of bringing home a child. After all, the adoption peeps, they know about Redneck. While my case workers have been surprisingly cool about it (even when I've made the dumbass move of openly mocking the process thereby shooting myself in the foot) I worry that the case worker(s) to any future child we are interested in calling our own may not be so happy to read my public rants about this process. It's been a difficult balance in trying to maintain the integrity and honesty of my own personal feelings and what I want to say on this site while trying to protect any future chances of having a new child lovingly drool on my shoulder and call me Mom. So I've tried to play it quiet, and safe. Having had to pluck my bloodied foot out of my mouth more than once, I've learned my lesson. The truth is, there is not much going on in the adoption front and yet a whole bunch of stuff that I'm dying to share with you all, but it will have to wait at least a few more weeks. But I swear, as soon as I can legally get away with it, I'll be shouting the news from my virtual rooftop with a bull horn. 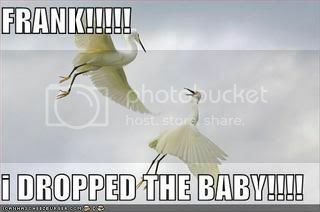 I'm hoping a stork will drop one into my open arms. I'm a great catcher. What I can tell you, is about six weeks ago, Boo and myself, along with the kids, put in an official request to adopt a little boy who is seven and has some severe disabilities. After much family discussion, we decided we could easily love this little boy as if I had squeezed him from my own loins. It wasn't a very difficult decision to tell the truth. This boy is beautiful and in dire need of a forever family. We all believe he would be a great addition to our family and we really believe we are the family this child needs. However. Because there is always a however when you are dealing with a government bureaucracy. This special little boy happens to be in limbo. Meaning he is with out a case worker of his own at the moment to review any adoption requests. So our paperwork is sitting on someone's desk, waiting to be reviewed and our plea to adopt him silently waits to be reviewed to see if his case worker feels we are a good match with this boy. I'm taking it all in stride, because I firmly believe if this boy is meant for us, he will come to us. If it doesn't work out, read: his case worker decides against us for some reason, then it wasn't meant to be. And there could be a variety of reasons his case worker could chose NOT to place him with us. Until we hear some news, I am just exercising my patience muscles and trying not to tear my hair out with worry and anticipation. All of this waiting is made easier because there are other wonderful things going on as I type this; things that make me smile and will surely bring a sliver of sunshine to your lives when I'm finally able to announce the details. Until then, hang on to your undies and practice flexing your patience muscles. We can do it together. It's not fun, but hey, misery really does love company, no? A blogging daddy whom I adore and must publicly urge you all to wander over and say hello to if you haven't already (cuz he's really cute and says he's got Ryan Reynold abs...heh) asked me a question that hasn't been asked on this blog before, but is one my husband and I ask ourselves all the time. Backpacking Dad wants "to know what you fear most about successfully adopting a child." If my husband were to answer this I believe he would tell you that he fears a reprise of Bug's demise. Shale's death took so much out of us and hurts us still so very deeply that none of us ever want to go through that again. Yet, none of us choose to be shackled with 'what if's' and fear of the worst. So we plunge ahead with our quest to bring home another medically fragile child, knowing the worse case scenario is always a possibility and we are opening ourselves up to the worst type of pain. But the flip side to that coin is we are also bringing with that fear, the best and most wonderful type of joy and love into all of our lives. It is a sweeter and more pure love than any other type of love Boo and I have ever experienced. Even if it is a thousand times more heartbreaking and frustrating and painful. To us, the trade off is worth it. However, since this is my blog, I have a different answer than that of my husbands. What I fear the most in successfully adopting a new little person is not in losing this child. I tend to worry more about my extended family, my friends and my community not bonding with our new child. I worry that because this child will look different, act different, be different that maybe our friends and family won't be able to open themselves up to loving this child as they would have if we had given birth to him or her. The damage of Bug's sudden death was and is far reaching. It wasn't only our family who was devastated by his loss. So many of our community of loved ones put so much love and energy and effort into our Shale's life that his death hurt them deeply and lastingly. I worry my friends and family won't be able to see past Bug's demise and get to know the beautiful light of our new child in fear of feeling the same horrible hurt all over again if the past should repeat itself. However, that is mostly an irrational fear of mine since I have the greatest family, extended family, friends and community a person could ever wish for. The people in my life have some of the biggest and greatest hearts I have ever known, which is why it has been so easy to want to adopt such a special child to begin with. Because I know they will be surrounded with love. I also tend to worry if my children's hair isn't combed or what people will think if I show up to soccer practice drinking from a bottle wrapped in a brown paper bag, so I try not to let my worries run my life. A reader named Sara asked if "I ever wonder where you would be in life now if Bug hadnâ€™t died?" The pain I feel two and a half years after his passing still takes my breath away and pricks tears in my eyes. There isn't a moment I don't think about him and wonder what he would be doing if he were still with us. Would he approve of getting a new sibling? Would we already have adopted by now? Would the adoption process have been easier if we hadn't had to jump through hoops of fire because we buried one child? I wonder who Fric and Frac would have grown to be if they hadn't had to face the cyclone of grief that tried to swallow them whole. Who would they be if they didn't have to wrestle with an almost five year old ghost every time they walk past his picture or start to think about him in the quiet of the night. I wonder if I will still remember his scent and the rough pads on his fingers from constantly having them in his mouth when I'm a frail old woman. I wonder if his memory will still mean as much to then as it does now or if time will soften the grief that still rages inside of me. I wonder if I will be able to ever hold a blonde little boy with wavy hair and not think of my son and wish for a single second that it was my son I was holding in my arms. I wonder if he were alive if he would still give sweet high fives to anyone who would ask and if he'd allow me to snuggle with him on the couch and breathe in his scent while nibbling on the soft spot in the crook of his neck. I wonder if he'd still be walking or if his height and weight would confine his poor broken feet to a wheel chair. Would he be able to communicate with us beyond shaking his head no or hitting out in frustration? Would I ever have discovered blogging and would it mean as much to me as it does now? There isn't a moment I don't wonder about what life would have been like if my son was still alive and I wonder if the moment will ever come when peace truly settles in my soul. The one thing I don't wonder is, if given the opportunity, would I do it all over again with Bug even if it meant repeating the same fateful night and reliving this nightmare of pain and tears all over again? Because the love he gave all of us was worth every tear I'll cry in my lifetime. Every laugh he giggled and every hug he squeezed is more than enough fuel to last myself, my husband and my children for the rest of our lives. His short life inspired us and his memory continues to grace us with love and gratitude. And we can't wait for a new little duffer to join our family and feel the blessings with us.